This report is aimed at those in licensing and IT leadership with a background or interest in IBM Informix product licensing and implementation. 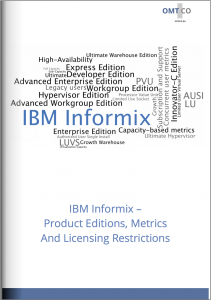 The report shows how Informix products are licensed, available in free and commercial editions, as well as detailing metrics and product and licensing restrictions. We give valuable advice and direction to IBM customers on how to deal with the challenges of Informix diversity and complex licensing. Chapter (I.) details Informix product editions and their associated product restrictions. Informix v12 is available in two free editions (Developer, Innovator-C) and six commercial editions (Express, Workgroup, Advanced Workgroup, Enterprise, Hypervisor, Advanced Enterprise). These different editions have different restrictions on various attributes, such as maximum cores, sockets or RAM. Chapter (II.) explains Informix metrics and attributes, and applicable licensing restrictions. Informix may be licensed with five metrics: four capacity-based metrics – Install (support only), PVU (Processor Value Unit), LU (Limited Use) Socket, LUVS (Limited User Virtual Server) – or one user metric – AUSI (Authorized User Single Install). The availability of metrics depends on the edition installed. Chapter (III.) lists Informix editions and their evolutions. The Enterprise Edition is used as an example to show the major changes over time; for instance, the changes in licensing metrics and restrictions. The path of all editions from v10 to v11.1, v11.5, v11.7 and v12.1 is also shown. Chapter (IV.) provides invaluable advice on how to optimize your licensing costs. Several methods can be used to optimize licensing: changing editions and versions installed, implementing sub-capacity, reducing users, purging legacy users and requalifying high-availability servers. In order to verify compliance and optimize licensing costs, IBM Informix customers must understand and obey the applicable product restrictions, permitted metrics and mandatory licensing restrictions. 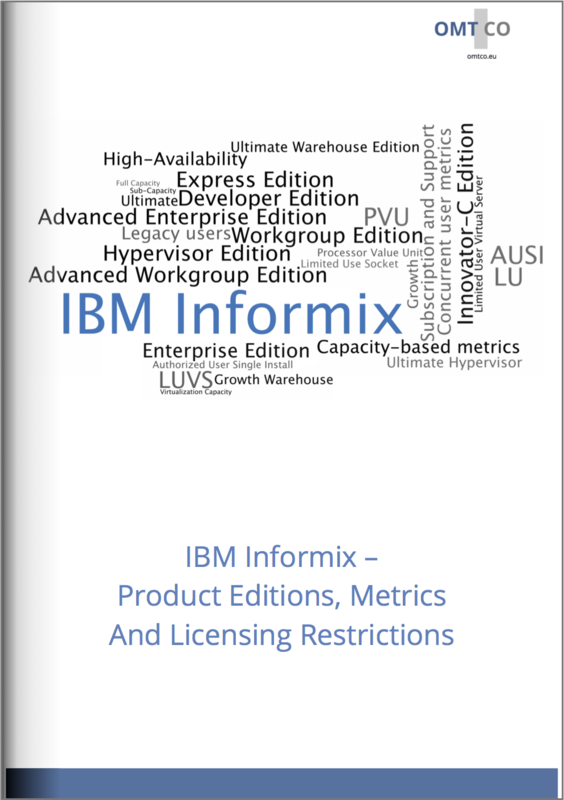 In the following report, we discuss various topics surrounding IBM Informix products: the available editions and their product restrictions, the permitted licensing metrics and their licensing restrictions. Server environments – for production and non-production (development, testing, staging). Free Editions – the Developer Edition and the Innovator-C (Community) Edition, the latter having free community support and optional commercial support. Commercial Editions – the Express Edition, the Workgroup Edition, the Advanced Workgroup Edition, the Hypervisor Edition, the Enterprise Edition and the Advanced Enterprise Edition. 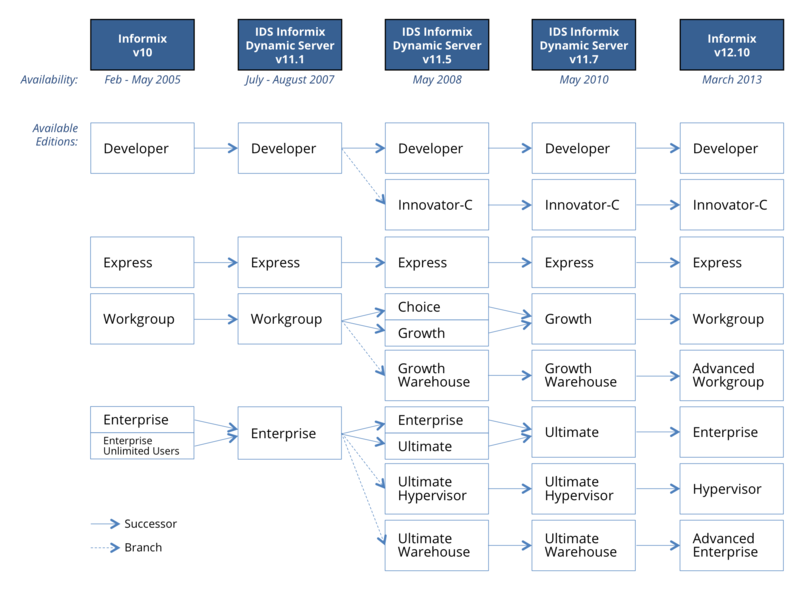 Informix editions have evolved over time. For instance, Informix v11.7, available from 2010, was available in the same free editions as v12 (Developer and Innovator-C) but was available in different commercial editions: Express, Growth, Growth Warehouse, Ultimate, Ultimate Hypervisor and Ultimate Warehouse. Cores – maximum number of cores per install. Sockets – maximum number of sockets per install. RAM – maximum RAM allocated to each install. 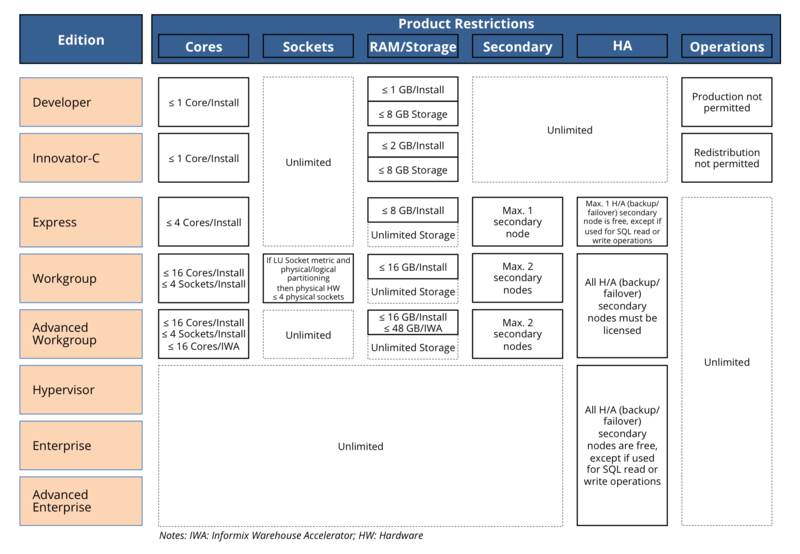 Storage – maximum permitted storage data (GB) per install. High-Availability – maximum number of secondary nodes (backup, failover). Operations – operations (production, development) of servers. Free editions with numerous product restrictions – the Developer and Innovator-C Editions are both limited to 1 core/install and to 1 and 2 GB RAM respectively. The Developer Edition is exclusively for development and testing. Innovator-C may also be used for small production loads, limited by processing power, RAM and data storage. Limited editions with some restrictions – the Express, Workgroup and Advanced Workgroup Editions have successively less restrictions and support small to high production loads respectively. These editions cost between 57 USD/PVU and 171 USD/PVU BL (Base Line pricing). Corporate editions with no product restrictions – the Hypervisor, Enterprise and Advanced Enterprise Editions are adapted to corporate environments and are not subject to any product restrictions. These corporate editions cost between 410 USD/PVU BL and 540 USD/PVU BL. Informix can be licensed with five metrics; four capacity-based metrics (Install, PVU – Processor Value Unit, LU Socket – Limited Use Socket, LUVS – Limited User Virtual Server) and one user metric (AUSI – Authorized User Single Install). However, the availability of the metrics depends on the edition. The different metrics are calculated using different formulas and different attributes, and are each associated with different licensing restrictions. The Install metric takes into account any instance of the product. The Install metric is available only for the Innovator-C Edition and only for support (yearly maintenance contract). PVU is the most widely known capacity-based metric. 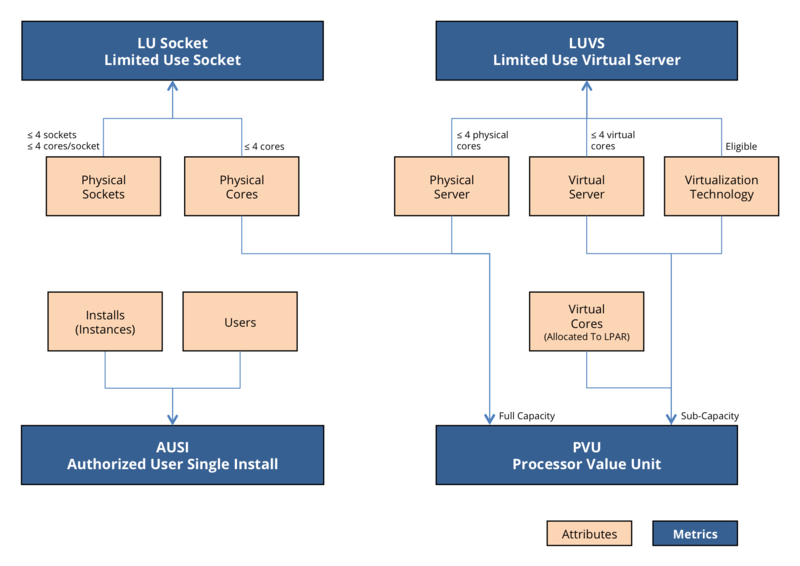 PVU is calculated in Full Capacity (or Sub-Capacity) by multiplying the number of processor cores in the underlying hardware (or the physical cores allocated to the virtual machine) by the corresponding value units per core (based on processor type and server architecture). Licensing per PVU gives the right to an unlimited number of users accessing any install on the licensed underlying hardware (in FullCap) or on the virtual machine (in SubCap). Licensing per PVU is available for all six commercial editions. LU Socket is one of the three hardware metrics available. An LU Socket license is required for each active processor socket. LU Socket is only available for Informix Growth Edition. The number of cores per socket is not taken into account in the calculation formula but is relevant to licensing as it is limited to 4 cores per socket. This metric imposes a limitation on the hardware: it may only be used on a physical server with a maximum of four physical sockets (and a maximum of four cores per socket). The LU Socket metric is available only for the Workgroup edition. A server, by the LUVS definition, is either a physical or virtual server, where only Sub-Capacity-eligible virtualization technology may be used. This metric is limited to a maximum of 4 physical cores (for any physical server or any server created through physical partitioning) and 4 virtual cores allocated to the virtual server (for any virtual server created through LPAR – logical partitioning). The LUVS metric is available only for the Express edition. AUSI belongs to Authorized User metrics, defined in relation to the people accessing the software, with restrictions in certain cases, for instance on the number of active sessions or the number of devices per user (secondary use rights). AUSI is derived from the Authorized User (AUTH) metric by imposing further restrictions on the number of sessions. An AUSI is a single user accessing one Informix install. Each user and each access to a supplementary install counts as one additional AUSI. The number of connections from each single user is irrelevant and does not count. AUSI licenses may not be transferred opportunistically to another user or another instance. Transfers are only permitted if the user or the Informix installation is permanently eliminated. The AUSI metric is available for the Express, Workgroup and Enterprise editions. The metric calculation formulas specify the attributes to be collected. In the case of capacity-based metrics (or user metrics), hardware attributes (or user attributes) must be collected. Servers entitled to Sub-Capacity, i.e. monitored by ILMT / TAD4D (PVU). Timestamps (first and last access per user and per instance), user status and tenure (to identify legacy users). In the following exhibit we consider the four available metrics for the commercial editions: LU Socket, LU Virtual Server, Processor Value Unit and Authorized User Single Install. Further attributes may be taken into account to reduce license demand, and thus licensing costs. Refer to chapter (IV.) later on for various methods which can be used to optimize your license demand. One of the main editions used by corporations is the Enterprise Edition. The Enterprise Edition has seen major changes over time, for example in its licensing metrics and restrictions. The following chart shows the evolution of the Enterprise Edition (its name was changed to Ultimate Edition at one point, but was subsequently reverted). The Informix product family editions constantly change over time. Some editions change names (Ultimate Edition v11.7 became Enterprise Edition v12.1), some split into branches (Workgroup Edition v11.1 split in v11.5 into Choice, Growth and Growth Warehouse Editions), and some merge (Choice Edition v11.5 and Growth Edition v11.5 merged into just Growth Edition v11.7). Stability And Simplicity – v10 and v11.1 showed simplicity. V10 had five editions, one of them being a variation of the Enterprise Edition. This was dropped in IDS v11.1, leaving four editions. Increased Complexity – IDS v11.5 increased the number of editions to ten, including two variations. These ten editions greatly increased the licensing complexity of the product family. Reduction in Complexity – with IDS v11.7 and v12.1, the last three years saw a disappearance of the edition variations, and a stabilization to two free and six commercial editions. IDS v11.7 to Informix v12.1 saw the edition names changed and a change in the available metrics. Different products or editions require different licenses – a license for one specific product or edition cannot be used for an installation of another product or edition – excepts if explicitly permitted. For instance, a license for IBM Informix Express Edition may not be used for an installation of IBM Informix Enterprise Edition. Different versions require different maintenance – IBM Informix Express Edition v11.1 requires a license under active maintenance until at least 6 July 2007 (day of availability). IBM Informix Express Edition v12.1 requires a license under maintenance until 26 March 2013 (availability). Different products/editions or versions require different licensing – IBM Informix Ultimate Edition v11.7 allowed for the use of AUTH, FUSI and PVU metrics. The successor product, IBM Informix Enterprise Edition v12.10, only permits the use of two metrics, PVU and AUSI. Licenses – different products or editions require different licenses. Maintenance – different versions require different maintenance (end dates). 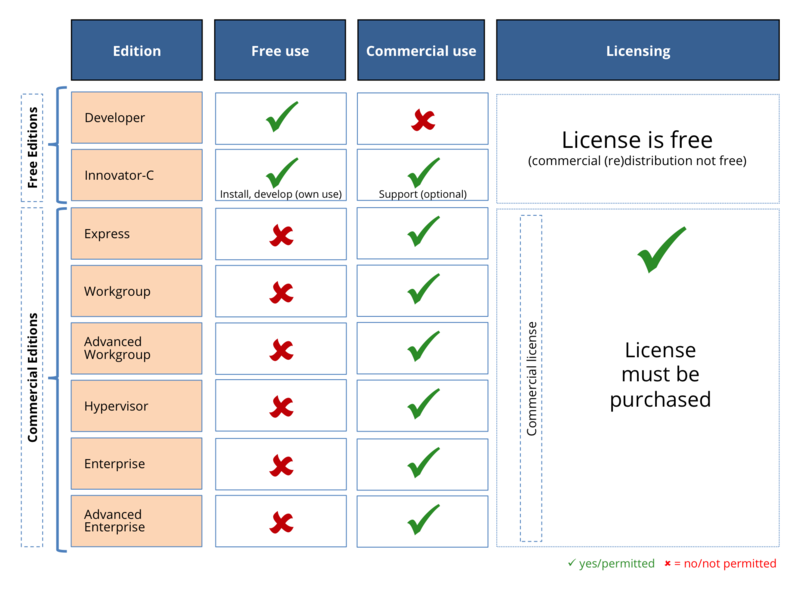 Licensing – different product/editions and versions require different licensing. By default, servers under the PVU metric are licensed following the Full Capacity counting rule: all cores of the underlying hardware must be counted, even if a product is installed on a virtual server. Breaking virtualization clusters into smaller clusters and/or smaller hosts (smaller underlying hardware) reduces the PVU license demand in Full Capacity. The license demand using the PVU metric for PVU Servers entitled to Sub-Capacity is calculated following the Sub-Capacity counting rule: only virtual CPUs (physical cores allocated to the virtual machine) must be counted. Implementing Sub-Capacity reduces license demand in most cases (some exceptions exist where SubCap and FullCap generate the same license demand; for instance, dynamic virtual CPU allocation). The larger the underlying hardware, and the smaller the VMs with Informix installs, the greater the reduction in license demand generated by Sub-Capacity. Some editions and metrics allow for the advantageous licensing of high-availability. For instance, in the Hypervisor, Enterprise and Advanced Enterprise Editions, all high-availability secondary nodes for backup and failover are free, except if used for SQL read or write operations. If you have many redundant secondary nodes, migrating to one of these corporate editions would reduce your license demand. Further concentrating SQL operations on fewer nodes additionally reduces the need for licensing. 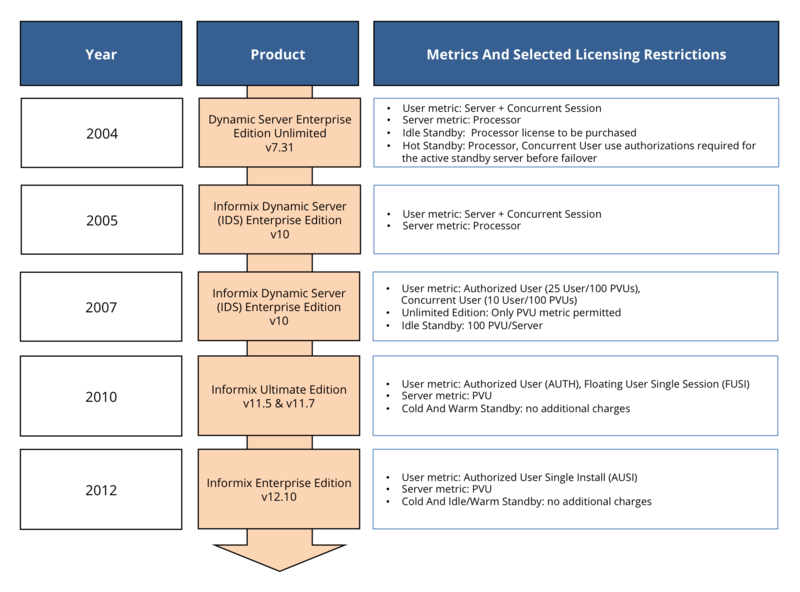 Informix v11 and v12 may be licensed using several user metrics. Authorized user metrics are defined in relation to the people accessing the software. Further variations of the authorized user metric are created with supplementary restrictions. For instance, the AUSI metric (available for Informix Enterprise Edition v12) is an authorized user metric with a restriction on the number of installs accessed by each user. Concurrent user metrics are based on authorized users with supplementary restrictions on time, on the number of active sessions, or on both. Concurrent user metrics were available in Informix v11: FUSSSI (Floating User Single Session Single Install – restrictions on time to simultaneously count opened sessions connected to any install by any user) was available in IDS Growth and Ultimate Editions v11. Mandatory User Attributes – then, further attributes and restrictions, specific to the product installed, may have to be considered for collection (depending on the relevant License Information documents and Program Announcement Letters). Optional User Attributes – and last, optional attributes, necessary to optimize license demand, such as attributes to purge legacy users (tenure in company, etc.) should be collected. 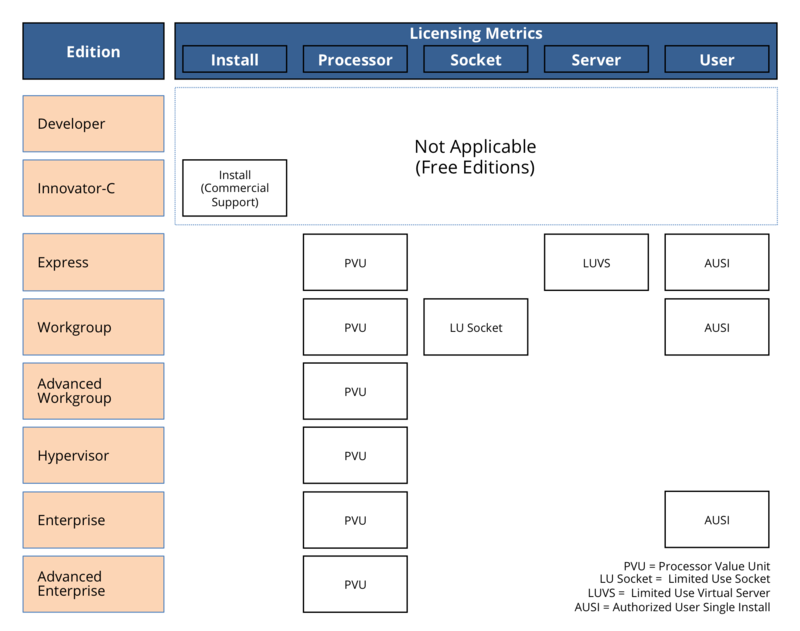 Informix products have multiple choices for licensing; for instance, Workgroup Edition v12 has alternative metrics available: PVU, LU Socket and AUSI. Customers may then select one of the available metrics, reducing licensing demand. For example, an installation of Workgroup Edition on a large hardware server with a small number of users accessing the installation should be licensed with the AUSI metric. On the contrary, a small server with many users should be licensed with the PVU metric. IBM Informix products have many pitfalls related to editions and their associated product restrictions, available metrics and their licensing restrictions. Editions – The evolution of editions with creation, splitting, merging and the disappearance of many editions leads to complexity and confusion in licensing. Furthermore, each version of Informix has numerous editions, for instance Informix v12 is available in eight editions, of which two are free and six commercial, all with different licenses, maintenance contracts and product restrictions. Metrics – Various metrics are available, and they depend on the edition considered. Each metric is calculated with its own formula, taking into account specific hardware or user attributes. For instance, the Express Edition permits PVU, LUVS and AUSI metrics. The PVU metric is subject, by default, to Full Capacity and, by exception, to Sub-Capacity. We recommend customers to seek assistance from IBM product and licensing experts, augmented by IT infrastructure understanding, to ensure that the the licensing of Informix installations is fully and correctly determined and that license costs are optimized as much as possible. OMTCO’s IBM product and licensing expertise, supplemented by knowledge of IT infrastructure, ensures competence to practical requirements. Should you wish for advice tailored to your specific needs, please call your OMTCO representative directly or contact OMTCO at ibmlicensing@omtco.eu. Use ILMT License Metric Tool (Exceptions apply for smaller customers, < 1000 employees or < 1000 PVUs fullcap), maintain signed reports > 24 months and disclose to IBM. THIS REPORT IS AIMED AT THOSE IN LICENSING AND IT LEADERSHIP WITH A BACKGROUND OR INTEREST IN IBM INFORMIX PRODUCT LICENSING. THE REPORT SHOWS HOW INFORMIX PRODUCTS ARE LICENSED, AS WELL AS DETAILING METRICS AND PRODUCT AND LICENSING RESTRICTIONS. WHEN YOU CONDUCT AN INTERNAL COMPLIANCE REVIEW, OR WHEN AN IBM AUDIT CONFRONTS YOUR ORGANIZATION, OMTCO IS BY YOUR SIDE TO PROVIDE YOU WITH LICENSING EXPERTISE, COUNTER-AUDIT EXPERIENCE AS WELL AS NEGOTIATION SUPPORT. Should you wish for advice tailored to your specific needs, raise comments or ask questions, please contact OMTCO at info@omtco.eu or call your OMTCO representative directly.